• unwanted changes in the browser configuration of Internet Explorer and Firefox. If an attempt is made to redirect your computer to a different Domain Name Server without your permission Spybot can detect and stop this happening. Spybot also protects your privacy is by removing ‘Usage Tracks’. Spybots team of ‘Forensic Detectives’ constantly monitor the Internet for new threats and attack vectors so it is important, that in order for software to give maximum protection, it is regularly updated. The signatures for Spybot Free Edition are updated once a week. 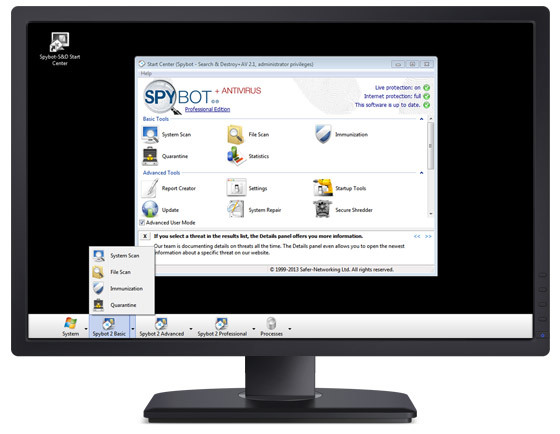 Spybot +AV is a licensed version of Spybot that enhances the protection offered by Spybot Free Edition. This product not only protects against spyware but also incorporates an award winning antivirus engine licensed by Bitdefender. What is SpyBot Search and Destroy? Today, in order to protect yourself, it’s best to also think about protecting your computer. With Spybot Search and Destroy, your computer is protected from adware files, trojans, dialers, browser hijackers, rootkits and other infectious malware software. Don’t know what a rootkit is? No need to learn what it is now. With Spybot’s help, your computer is protected. Spybot Free Edition, you guessed it, is a free security software tough enough to stand up and fight most spyware, cookie-tracking softwares and aggressive advertisements (pop-ups). Instead of allowing malicious applications into your Window’s registry, either to track or infect your computer, SpyBot Search and Destroy will prevent them from infiltrating your PC, and remove any unwanted cookie trackers, too. Though cookies are a ’normal‘ addition to surfing the web, some cookies are unwelcome, and can bog down your computer and browser. I have used the SpyBot Free Edition for many years. From my experience as a long-time Windows and internet user, I can’t express my interest enough in this product. I would recommend running this software at least once a week to pick up the most intrusive spyware your computer has picked up from your website browsing history. If you are like me, you don’t want websites to track your online habits. Typically, I have seen that anti-virus software do not find concern in “tracking cookies” or other programs specific to aggressive online marketing. With SpyBot Free Edition, my computer is protected where my anti-virus fails to perform. Let’s take a look at the basic and advanced tools in the information I have provided below. Basic, advanced and professional tools are available through SpyBot to protect your computer. All basic tools, and most advanced tools are included in the free version. For additional tools and anti-virus protection, a paid version of SpyBot, the “Professional”, is available for purchase. To use the basic tools, first click the “Update” button to stay up to date with the state-of-the-art software from SpyBot. This will have your computer ready to go with the latest and greatest before you begin the next step, scanning your computer. The second step in using the basic tools is to do a “System Scan”. This will systematically scan and detect any infections or cookies in your computer. Allow SpyBot to methodically go through the computer and detect any unwanted malware or other computer threats. Do this weekly, and your computer will be well protected. Though not needed on a weekly basis, you can also click “Immunize” to protect your Windows programs directly after new Windows updates are installed. Typically, a home user who “immunizes” their computer after each Windows update, and scans their computer weekly with SpyBot, is very well protected. As you can see, with basic tools you get much more than ‚basic‘ or nominal protection. Basic tools don’t stop there, there are still many more features to the ‚basic‘ program. Use the “Quarantine” tool to directly purge quarantined items from your computer. Additionally, click on “Statistics” to check out and easily review your computer’s latest scanning ’stats‘. You can never know ‚too much‘ about your computer! Conversely, learn more about recent development and news at SpyBot by clicking “News!”, or, consider thanking the engineers behind SpyBot by donating a small contribution through the “Donate” link provided. Let’s take a look at what the Advanced Tools offer. Here you can easily learn how to optimize your computer with SpyBot’s advanced protection technology. Archive and keep track of SpyBot’s performance through a SpyBot-created log, or archive. This log will support you or SpyBot’s customer service support team in case you need help assessing internal problems in the future. All log files are designed and saved in the location, “C:\ProgramData\Spybot – Search & Destroy\Logs“. Startup Tools allow you the flexibility of when and how selected programs will run. Choose which programs you wish to run automatically or at start-up. This tool makes it very flexible to use specific programs though best altered only by advanced users. Rootkit scans are sometimes difficult to determine. Is it a bad bug? Or legitimate software that uses rootkit technologies? Rootkit scans are available through SpyBot and are recorded through SpyBot’s internal log. If you are unsure if the rootkit is safe or not, our friendly online forum is happy to help determine what needs to be cleaned up, and what is ok to keep. Sometimes useful, legitimate software can look more malicious than what it is. Please use the link provided below to learn more about rootkits. Advanced features, as found through the ‚System Repair and Secure Shredder‘ tool are not available in the SpyBot Free Edition but are well worth mentioning. Features including special mobile phone scans, protected repairs, boot CD creation, command line tool options, anti-virus protection and tougher anti-malware are available through paid versions of SpyBot. In general, SpyBot will not slow down or freeze up your computer like most large anti-malware software products available. Its friendly, easy-to-use interface and basic toolkit are effortless to use even for the most inexperienced computer users. Installing the software is fast and easy. After downloading SpyBot, users can quickly begin scanning their computer for any potential threats; and keep their computer protected. If you suspect an infection, download SpyBot and begin scanning your computer. Skip on immunizing your computer as it may complicate the process and reduce the success in finding the problem- or hopefully not, multiple problems. In today’s world of cyber crime and online trickery, it is crucial to feel safe using your computer and the internet. With SpyBot, protect yourself and your computer before mistakes are made and damaging programs take over your computer. Try the free version of SpyBot and take advantage of the many features available in the basic package or go pro with the paid professional version(s). There is no better version of free anti-malware protection available than the SpyBot Free Edition.